This adventure is quite short - designed to be played in a single session - for level 4 characters, and opens with a warning that you need a good mix of specialists and plenty of fighting types, and that there are ample opportunities for the incautious to come to grief (terminally). The mission is quite simple - to save the girl - but in actuality it's very difficult to actually rescue her even when the party manages to triumph over evil. A quite extensive background explains what is going on and how events over the past few centuries gave rise to the current situation. It all started with a deal with a devil, always a risky thing to do; but this one seemed to be working well until it came time for the devil to collect... The deal was, to give a wizard called Edward Magnussen great good fortune and other abilities which he parlayed into the position of Duke and command of the realm in which the action takes place. In return, he was to give over not just his soul but those of his next twelve male descendents and that of the next daughter born to the line. He was then to receive immortality, although for the meantime he'd die like any other mortal. For the party, however, it all begins when they are in a packed crowd to witness an execution. On the block is a prophet who had suggested that the daughter of the current Duke be killed now before any fell fate befalls her - because she, of course, is the last link in the devil's deal. Up on the city walls, the Duke and his daughter watch the proceedings... and then she is carried off! The Duke immediately offers a fortune in gems to whoever gets her back. It's easy enough to find out where the kidnapper took her - but it will take a good delve through caverns and crypts and a fair bit of fighting to deal with the evil that's going on, let alone get the poor girl back. There are a few rumours to pick up before the party sets out - some of them even have a slight germ of truth. The delve is perilous and can land the party in some interesting places - even a circle of Hell - and it's unlikely that they'll all return. The comments on the fates of various playtest parties make quite grim reading. But there's more! Tucked away at the back there's a whole level 2 adventure The Balance Blade. It's another single-session piece, and it is suggested that it is played as a one-off, as it basically ends with a full-blown party brawl - as in, with each other. Many players are not comfortable with this, and it does no good to party cohesion. It hinges around a wizard whose patron sends him on a quest, and requires some detailed preparation before running it, if it is to be presented to best effect. Unfortunately the patron is somewhat economical with the truth when asking the wizard to go on the quest, and so everything falls apart pretty quickly. For a start, the entire party gets transported to the adventure site before the poor wizard even gets a chance to ask them if they'd help him in the errand that he's been given. And if that wasn't enough, there's a collection of Seven Strange Skulls right at the end of the book. They are there for you to use in your own adventures, and strange they are indeed! Whilst everything here is fun, it's a bit of a mish-mash and somewhat gives the air of having felt the need to put out a 16 page book before there were 16 pages of material to fill it! 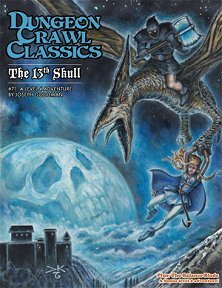 Still, you should get a couple of enjoyable (if deadly) sessions out of the adventures, and then you still have the skulls to play with! Return to The 13th Skull page.